Courtney Coyle for reviewing the text and assisting with revisions. The traditional homeland of the Quechan, in the deserts of southeastern California, covered 880 square miles. In the 19th and 20th centuries, the California desert became a prominent site for gold mining and most of the Quechan lands were taken from them. Archaeological evidence indicates that native people have used the area around Indian Pass, known as the “Indian Pass-Running Man Area of Traditional Cultural Concern,” for at least 10,000 years. The Quechan continue to use the network of trails in the area for spiritual practices such as Dreaming, a meditative state that requires a pristine visual and aural environment, the Keruk Death Ceremony, in which relatives cremate the deceased and assist in their journey to the other world, and spirit runs with tribal youth. When Glamis Gold, Ltd., a Canadian firm, announced its intention to mine gold in that area, long free of mining, the Bureau of Land Management began to study the environmental impact of the proposal. After six years of public hearings, two draft Environmental Impact Statements/Environmental Impact Reports (EIS/EIR) and a final report in 2000 — all with extensive public comment — then-Secretary of the Interior Bruce Babbitt made a final decision to deny the mine proposal in January 2001. In March, Glamis filed a complaint in D.C. District Court challenging Babbitt’s decision. The court challenge coincided with the change in administrations, and the fact that one of Glamis’ attorneys was on the Bush transition team didn’t bode well for Indian Pass. Interior signaled its friendliness with the mining industry when the new DOI Solicitor issued an opinion saying that DOI cannot deny a mine because of “undue impairment” of cultural or environmental resources. In October 2001, Interior Secretary Gale Norton rescinded her predecessor’s denial of the mine and reopened the permit process. Though DOI and Glamis officials met numerous times before Norton’s decision was announced, members of the Quechan Nation read about it in the newspaper. In June 2002, amid increasing publicity, the National Trust for Historic Preservation listed Indian Pass as one of the Eleven Most Endangered Historic Places in America. Excavating a giant 880-foot deep open-pit gold mine amidst the Indian Pass trail system and its ceremonial sites would destroy the integrity of a pristine environment and ancestral locations used for prayer and meditation. The 1,600-acre construction project would intrude on natural ridges and bring ceaseless machinery noise to a quiet desert. Digging huge open pits would forever destroy archaeological sites. Massive waste piles will build up and there will be extensive ground disturbance caused by pipelines, water wells, roads and electrical lines. Glamis does not plan to backfill the largest and deepest of the three proposed open pits due to high costs, leaving a permanent 88-story-deep industrial crater on protected public lands. Opponents of the mine pointed out that many recent gold mines have expanded beyond their initial proposed area and that this possibility was not addressed by the EIS/EIR. 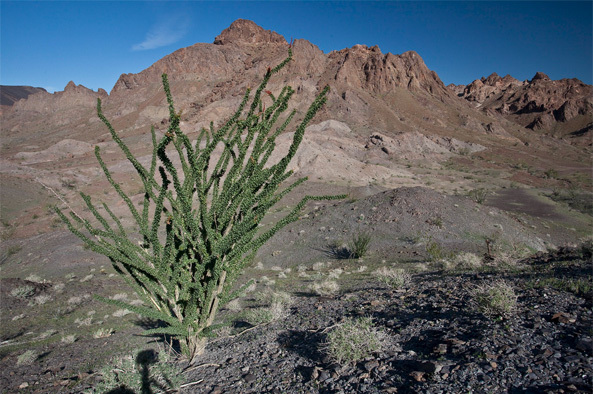 Beyond destruction of sacred lands and the impact on Quechan culture, the mining would have detrimental impacts on recreational users such as hikers, campers, and backpackers, and on local woodlands that provide habitat for the threatened desert tortoise and other fragile desert species. Mining companies claim their industry creates jobs, but often the mines have a limited impact on the local economy — simply extracting resources and profits, which pay off foreign investments. Soon the mines’ operations, and any economic benefits, are gone. But the unmitigated environmental and cultural damage remains. Traditional Quechan land is already host to the only 3 modern gold mines in southern California, an indication of the environmental racism that makes low income communities of color more likely to bear the brunt of environmental damage. To add another gold mine, on land that is sacred to them, would be a further affront to the Quechan people. The original decision made by the Department of Interior was a carefully reasoned, well-documented decision that the Bush administration should have vigorously defended in court to show its respect for all religions in America and to implement the protections adopted in the California Desert Conservation Area plan and the will of Congress. The hopes of the Quechan people were dealt a blow when the Solicitor for the Department of the Interior issued his opinion reversing the Clinton administration’s decision. Gale Norton still has the power to reaffirm the original decision and deny a mine permit. The Bush administration must hear from the public concerning the freedom of religion for all Americans, including Native Americans. A recent editorial by Republicans for Environmental Protection affirms bipartisan support for protecting Indian Pass, noting the company’s stated intent not to clean up the mine site and the importance of the area to the Quechan people. The California Attorney General’s office recently affirmed the original Department of the Interior opinion, stating its strong support for the legal arguments contained in the original opinion and opposing any new evaluation (see anApril 19, 2002 news brief for more information). In August 2002, the California State Assembly and Senate passed SB 1828, a sacred lands protection bill which was vetoed by California Governor Gray Davis. However, in his veto message Davis said, “The protection of sacred sites is a matter that must be addressed.” The revised version, A.B. 974, failed to pass by three votes at the end of the 2003 legislative session. The Tribe and its allies are still seeking permanent protection for the area, which might involve making it a National Monument, extending the Indian Pass Area of Critical Environmental Concern, or attaching it to the nearby Picacho Wilderness Area, which would protect the area but avoid the need to identify archaeological or sacred sites. In July 2003, Glamis sent a notice of intent to file a claim against the United States pursuant to the North American Free Trade Agreement (NAFTA). Glamis, a Canadian subsidiary, claims its property interests were expropriated by SB 22, the California legislation requiring backfilling of open pit mines. Glamis is seeking over $50 million in damages. Under NAFTA, the parties have 90 days to seek agreement; after that Glamis may file a claim to be considered by a tribunal. The process is largely secret. The only parties recognized are the United States (represented by the Department of State) and the company. However on September 19, 2005, the Tribe received permission to participate in the process via the submission of “non-disputing party” material, similar to a “friend of the court” brief. This gives the Quechan an opportunity to present NAFTA officials with information the State Department could not provide: as the ancestral guardians of Indian Pass, the Quechan are the only people who can explain its significance to the international body. Secondly, because the Interior Department reversed its earlier decision, officials there could influence the strength with which the State Department defends the California law. The Tribe feels an additional responsibility since NAFTA’s decision in this case may set a precedent affecting indigenous people and similar disputes around the world. The NAFTA tribunal’s order to accept the Quechan submission and the submission itself, along with other case documents, can be found on the State Department’s Web site.